The use of RFID wristbands for resorts and attractions has grown significantly in the past 5 years. Ever since Disney’s MagicBand burst on the scene in 2013, the theme park industry has rapidly adopted RFID technology. Age-old paper wristbands and tickets are being replaced with cutting-edge state-of-the-art contactless passes, in the form of wristbands or cards. But, RFID tags are nothing new in the leisure industry, hotel key cards have utilized RFID since the early aughts. Now, attractions are rolling out the technology across multiple functions, putting RFID technology at their heart of their operation. Less time waiting in line for guests, and increased revenues for owners are just two of the well-documented benefits of RFID wristbands. But, there are many other ways to get more bang for your RFID buck. With that in mind, here’s a list of 8 benefits RFID wristbands can bring to your attraction, resort or theme park. Nobody likes waiting in line. Check-in is the gateway to the rest of the attraction. Whether a hotel or a theme park, overcomplicated admission processes will frustrate guests and negatively affect their experience. RFID systems speed-up access control. RFID cards or wristbands can pre-authorise and sent out in the mail, allowing guests to self check-in on arrival. This gives your guests control over their check-in, can reduce staff costs and improve first impressions. RFID cards or wristbands can easily be re-programmed on the fly via a POS if they are lost or stolen. Put simply, RFID works like a contactless credit card. RFID wristbands enable cashless payments, allowing guests to pay for drinks, food, and merchandise with a quick and easy ‘tap’. All without having to worry about handling soggy cash or carrying around a wallet. Furthermore, the disassociation with cash that comes from using RFID wristbands results in an average increase spend per-head of between 15-30%. RFID wristbands reduce stress. Freeing-up guests from carrying cash, keys, and credit cards allows them to enjoy resort facilities without a worry in the world. So that they can focus on having fun at the attraction – increasing impulse spending on rides, restaurants, and retail. This is something that Universal Studios Florida has invested heavily in at their third park Volcano Bay, which opened in 2017. 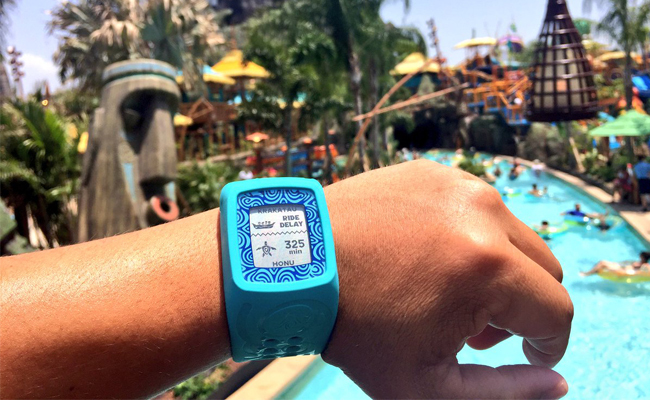 Using RFID technology, their TapuTapu wearable band brings a new level of convenience with Virtual Line technology and lots of interactive enhancements throughout the park. Guests can even touch their TapuTapu bands to totems around the park, to virtually hold their place in line. The band then alerts them when it’s time to ride. Talk about a VIP experience for everyone! Allowing children to have their own wristbands for purchasing food and drinks, gives them a sense of independence. RFID technology allows parents to set spending limits, or remove the option for payments, leaving it solely as a key for room and locker access. RFID systems also offer ways of increasing child safety. A parents’ RFID wristband can be linked to their child’s, preventing minors from gaining access to certain areas or leaving a perimeter without their parents. What’s more, our RFID wristbands are 100% waterproof – and can take on water rides, slides, showers, and even sunscreen lotion. Operators will see improvements in their bottom line because RFID technology eradicates the chance of fraudulent passes that negatively impact revenues. The opportunity for theft and fraud is reduced when guests only need to wear a wristband. There’s no need to carry cash, credit cards or even a wallet. And, just like a credit card, if an RFID wristband is lost or stolen, an RFID system allows easy cancellation and re-issue. Parents will also find comfort in the fact that if a child is lost, RFID wristbands can be used to determine the last location of the child. RFID technology enables integration with social media. Visitors can choose to link their RFID wristbands to their social profiles and open-up a whole host of fun experiences. Once linked, guests can post photos to Instagram, or ‘check-in’ on Facebook, all by tapping their wristband against an RFID touch-point. This gives guests something to share socially with friends while providing free online advertising for your resort, or waterpark. Visitors can do things like shoot water cannons at other guests, and illuminate images in the volcano’s hidden caves. The introduction of RFID at resorts has reduced the need for guests to carry multiple items for access and payment. Now, credit cards, room and locker keys can be combined into one RFID wristband or card for the ultimate convenience. Add to this, the ability to link social media profiles, and you have a trifecta of apps, all on your wrist. Your operation and the experience of your customers is instantly optimized. And, when you provide guest satisfaction, your visitors come back time and time again. With RFID present at your resort, you’ll have the ability to collect intelligent data and deep analytics. You’ll easily discover how guests use, interact with and move around your attractions. Helping you to determine traffic patterns, dwell times for rides, and tap into undiscovered operational efficiencies. With RFID cashless wristbands in action, you’ll also get smart data on purchases, allowing for optimized merchandising and concessions. Data gathered from RFID system integrations is used to streamline and improve experiences for future guests. The benefits RFID systems offer resorts, theme parks and practically any type of attraction, are staggering. RFID Systems are advancing, and more companies than ever are offering these solutions to the leisure industry. This helps drive prices down for operators looking to take the plunge into RFID. From cashless payments to line-busting access control, RFID wristbands at attractions are not the future, they’re the ‘right now’. This entry was posted in Ideas, RFID on February 15, 2018 by idandc.